Another short screened at Shriekfest 16. I’m a huge fan of low-budget, campy, bloody, over-the-top movies that come across as an excuse to get together with friends and make a movie as a giant middle finger to big budget hollywood pictures. In the true spirit of Troma Entertainment! 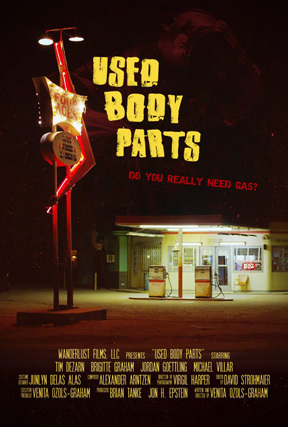 I was excited to see Used Body Parts based on the poster art alone, as it comes across as exactly what i’m describing above. Unfortunately it doesn’t live up to its full potential, but it also doesn’t fall completely flat either. It’s not quite acted well enough to be taken seriously, but at the same time it’s a bit too polished to be deliberately campy. The imagery falls into that same awkward middle ground where you aren’t sure if this is supposed to be fun or disgusting. I feel like this would be much more effective had they camp’d up the acting a bit and juiced up the dismemberment scene with exaggerated splatter and ridiculous scenery. Instead this opportunity was lost and unfortunately the movie is just alright, when I think it could have been ridiculously awesome.